William Strickland, born in 1788 in Navesink, New Jersey, moved with his family to Philadelphia two years later. Young Strickland met architect Benjamin Henry Latrobe while his father, master-carpenter John Strickland, worked on Latrobe’s Bank of Pennsylvania. At age twelve, William Strickland was enrolled in Mr. Lyttle’s school in Philadelphia, leaving in 1803 to begin an apprenticeship with Latrobe, serving with him for at least two years. He worked first as a surveyor’s assistant in Philadelphia and as a carpenter with his father. In 1808 he received his first architectural commission, the Georgian Gothic design for Philadelphia’s Masonic Hall (built 1809-1811). During the War of 1812 Strickland used his engineering skills on defense projects while also supporting himself as a landscape painter and a designer of engraved illustrations and designs for plasterers and carpenters. His next major commission for the Grecian design for the Second Bank of the United States (1819-1824) established his professional reputation. After 1826, Strickland’s designs for a series of Greek Revival buildings transformed Philadelphia. These buildings included the United States Naval Asylum (1827-1833); United States Mint (1829-1833); the First Congregational Unitarian Church (1828); the Blockley Almshouse (1830-1834); the Mechanics Bank (1837); and, most importantly, the Philadelphia (Merchants’) Exchange (1832-1834). Part of this transformation of the city happened on the University of Pennsylvania campus, then at Ninth and Market Streets. University trustees commissioned Strickland in 1828 to design a new home for the School of Medicine and then, a year later, a new building to house the College. 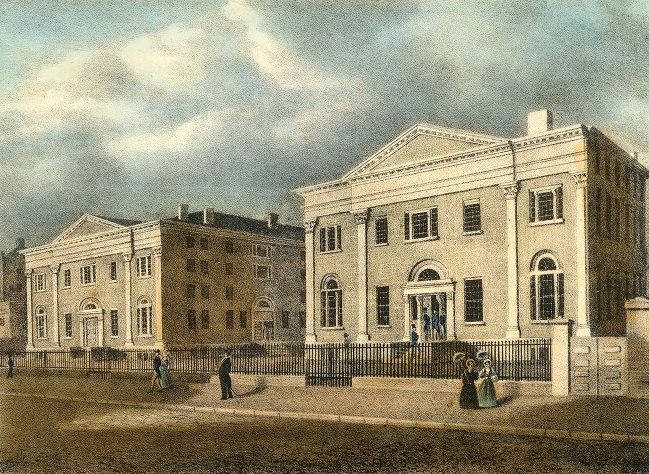 The President’s House, renovated in 1800 by Benjamin Latrobe to house both the Medical School and the College, was demolished in 1829 for the construction of these two Greek Revival buildings designed by Strickland. Strickland designed many important buildings throughout the United States, including commissions as varied as the U.S. mints in New Orleans and North Carolina, the sarcophagus for George Washington’s tomb at Mt. Vernon, and a number of engineering projects. He died while overseeing the construction of the Tennessee State Capital in Nashville in 1854.